Pool owners must install and maintain effective barriers to prevent young children from entering the pool area. horizontal - no wider than 1-3/4"
vertical - no higher than 4"
It is very important to check your local town codes before installing any swimming pool barrier, whether solid, with horizontal and vertical members or made using welded or woven wire mesh fence. Local town codes may vary. Still, relying on these precautions is not enough. Here is a sobering video showing the ingenuity of toddlers as they outsmart barriers created for their protection. Vigilance is required! Parents: Put down cellphones, tablets, and laptops! At all times you should be in the pool with children 5 and younger and have your eyes on children 6 and above. 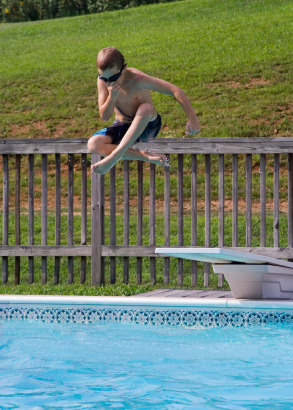 For further information, the U.S. Consumer Product Safety Commission has a 32-page brochure available as a PDF: Guidelines for Entrapment Hazards: Making Pools and Spas Safer.